Society for the Appreciation of the Lowly Tinned Sardine: Bad Blogger! A Bad, Bad Blogger! Bad Blogger! A Bad, Bad Blogger! Yes, I've been a bad blogger and a bad member of this society. I have consumed tin upon tin with intention to write about them but have been caught up and run over by life's wheels of confusion. Now those beautiful tins but a fleeting memory. I have photos but at this point I would be grasping at a memory to describe those fish in any detail. It'd be similar to wringing the last drops from a dry sponge or better yet squeezing the very last bit of juice from an already taxed lime onto the proverbial Taco Al Pastor of the blogoshphere. I have attached photos of a couple of tins that I will have to revisit in order to inform you all of their content. Which, if memory serves, was not quite as exciting as this one. Deliciousness....I think. 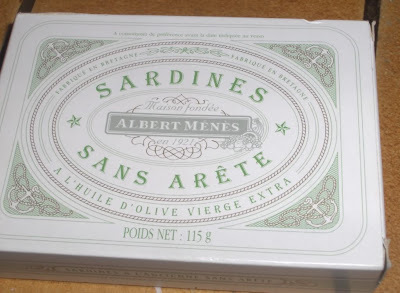 So, to reintroduce myself to the world of writing about sardines the plan was to take a visit to the Bon Marche for some real nice tins with the Wife and kids. However by the time we actually left the house it was getting too late, the Metro was packed and the kids were getting hungry. We ended up hitting the Franprix for a couple cans of Connetable Sardines. Hey, at least I'm blogging again, right? I mean they're good damn fish, especially if you're used to what you get in the States. First up was the 'Pen Duick' (a type of yacht?) 'Belles de l'Atlantique' Sardines in extra virgin olive oil. Okay, they were good I guess. When I opened the tin I was almost surprised by the size of these suckers. Some big ol' fish! We found them to be very unremarkable and bland. They were not at all fishy, which is good I guess, but could have really used a pinch of salt. The oil they were in didn't look so great either, so there's that. Oh, and they were firm and not mushy which is a plus. So, uh, I'll give these two tins. I think my persepctive has changed a touch. Next up is a tin I actually bought for lunch and is a regular staple of my diet, The Connetable Sardines in extra virgin olive oil with lemon. I like these. They're rich in Omega 3's ya' know? Anyway, upon opening this can I was comforted by the unassuming small size of these handsome fish. They taste clean and salty with a nice hint of lemon from the slices sitting at the bottom of the can. Yum. I found myself sopping up the quality olive oil with chunks of baguette. Yum again. 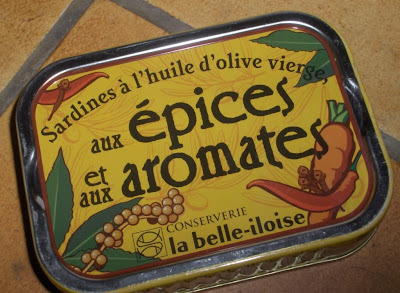 Although very satisfying and safe I give these Sardines three tins just because I have an idea of what exists out there, some truly remarkable four and five tin tins. I am a rejuvenated and inspired man....I think. It's a Spoiled Life your Wife allots You when a Connétable et Citron is but a Weekly Sustenance. Yeah, it's a matter of perspective. Connetable sardines are as commom here as Bumble Bee is to the US. Spoiled? I think so. Fascinating blog! I am learning so much about the elusive and mysterious sardine!